The holiday season is fast approaching and whether you buy cookies or enjoy baking cookies some of the best cookie recipes may cost your holiday baking budget some cash if you don’t plan in advance. With less than 2 months until the festivities there’s no better time to get baking than the present. If you wait until the last-minute you might find you get overwhelmed with having to shop for gifts, plan a dinner, getaway to the relatives, work and friends Christmas parties and then bake on top of it all. Some of my favourite Christmas cookie recipes that I like to bake and to eat are the butter cookies and the sugar cookies both of which are fairly inexpensive to make with butter being the costly baking ingredient. Making sugar cookies from scratch are probably one of my favourite cookies to make because it reminds me of home. My mum used to make shortbread but the butter, sugar and shortbread cookies all taste the same with a bit of difference in texture. This past year I posted a few of our favourite holiday treat recipes such as chocolate peanut butter balls, coconut balls and snow balls all of which are my most popular blog post recipes this time of year. I haven’t been making cakes as much this year as I did in 2012 but they can get quite costly as well depending on what type of cake you are making. Around the holidays using alcohol, sugar, butter, nuts, flour and even out of season fruits like figs and apricots can drive the price up of Christmas cakes that you might make for those special holiday gatherings. The prices of walnut pieces are at $17.99 a pound right now in the bulk store and If I see a sale you can bet I’ll jump in and grab them while I can. Just yesterday we picked up 4 bags of granulated sugar on sale for $1.44 which is the cheapest I’ve seen in ages so I picked up the limit of 4 at No Frills. I find I use lots of walnuts and pecans for holiday baking and the manufacturers know that bakers around the world commercially and in-house bakers like us will go through lots of nuts so expect the price to stay high for the most part. What we like to do is if I find them cheap throughout the year we buy them and freeze the nuts. You might remember all the cashew nuts we bought a few weeks back in our grocery game post and it was for the $1.99 price tag that we bought them because we know that nut prices will sky-rocket. If you are peanut fan you can usually find large bags of seasoned or salt and roasted nuts at Shoppers Drug Mart on sale for $2.50 a bag which is a great price in my opinion. I have a friend whose mother makes a chex mix and bags it up every year for their friends and family in clear bags and wraps with a bow. They give these away as gifts with a bottle of wine as a gift rather than buying gifts and it may seem simple and it is but it is very costly. Nuts and some chips like Fritos are not cheap but certainly make this treat one that we all look forward to every year as a tradition. What we do is start looking for Christmas baking ingredients earlier in the year or even a few months before the holidays. Butter has been on sale the past few months for around $2.88 a pound so we loaded up on a few pounds here and there and store it in the freezer. Butter will keep in the freezer for a few months but be cautious about how long it stays in there. We store it in a freezer bag and track dates on our freezer inventory list that is in our file folder. You can download a free copy from the blog if you want to track what is inside your freezer. Some people stick to the very simple and make easy peanut butter cookies to munch on for the holidays and you can easily chocolate them up by adding some of your favourite chocolate chips or chunks. The best chocolate chips to use if you are making simple choc chip cookies (that’s how the wife says it but I say choccie) are a mix of semi-sweet and milk chocolate for me personally but it differs depending on your sweet-tooth preference. The price of chocolate chips can get very costly although if you watch you might find the bulk bag 1kg of Hershey’s Chipits on sale for $6.99 or even $7.99 which is a decent price. If you are a Costco member you might find the cost of baking ingredients to be cheaper in bulk packaging as long as you will use the product which most people do who like to bake over the holidays. We’ve always found the best baking ingredients to be found at the bulk barn but not necessarily the cheapest in price. If there is an odd ingredient or you need fancy baking supplies especially if you want to make decorated holiday cookies usually the bulk barn will carry it unless you know of a baking supply store in your area or even try Micheal’s stores. Do you make any Christmas cookie recipes or other holiday treats? 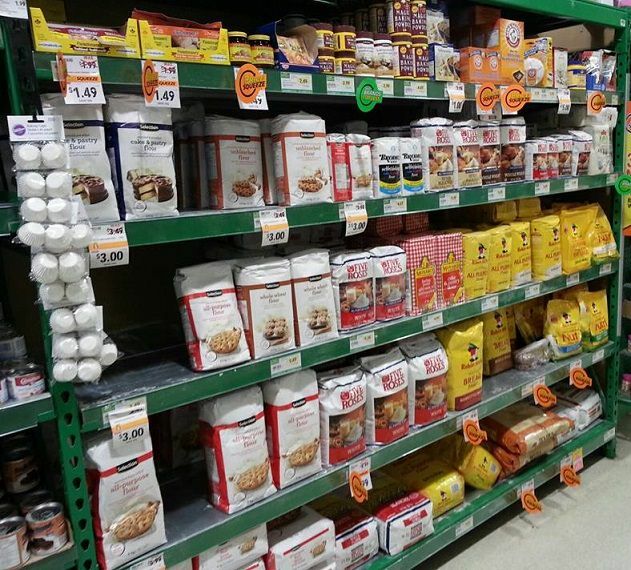 How far in advance do you plan to shop and bake? How do you factor in holiday baking costs into your budget? Since this is the first installment of the November grocery game challenge I will announce the October winner here. The winner of the grocery game for October goes to….. drumroll please…… #14 MARY C. I really hope we can get more fans on board with the grocery game challenge this month so please help me spread the word. Mary if you can contact me I will get your coupon envelope sorted out and sent off to you in the mail as soon as possible. You all make me proud. Thank you for participating with me every single month. We must have a GGC end of year online party 🙂 I’ll bake the brownies mmmm. Weekly Overview: This was a big shop for us and we wanted to load up on the fish since it was on sale and we love Basa fillets. We find that the cost of meat is getting so high now and if we can eat fish for less than we will opt for that choice instead along with sausages. We aren’t big red meat eaters so we don’t miss too much but it’s a pity the cost of chicken is so high at the moment. So bare with me….I did a lot of stocking up this week as hubby got bonus….hoping the next few weeks are MUCH smaller!!! Ouch….Extremely large shop this month 🙁 Had to stock up on some meat….which is quite expensive as i purchase the free from…but i figured i would buy a little extra as hubby got bonus….are now looking into having more vegetarian recipes each week so that our budget doesn’t go crazy!! Glad to hear you finally used that gift card lol. We use the credit card as well to earn points and that gives us some extra money once in a while if we need it. It all adds up. 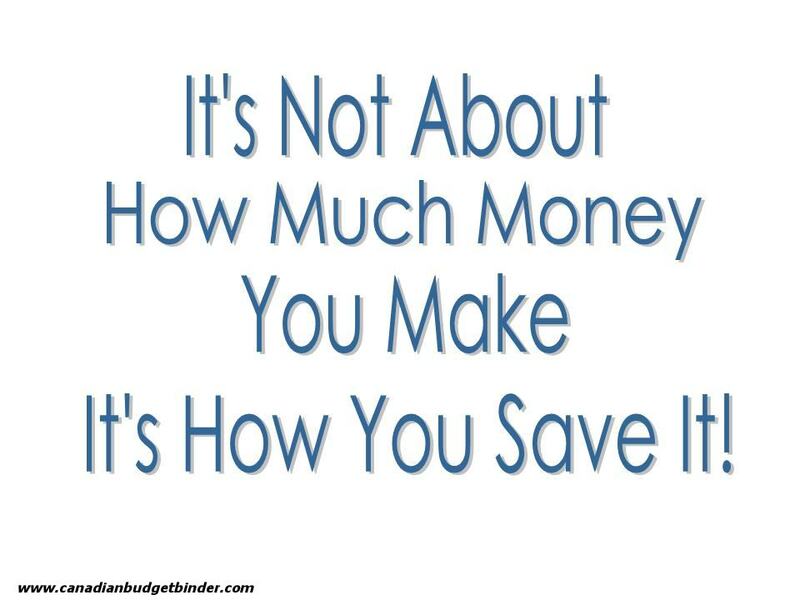 You could always add in birthday’s as a projected expense so that way you have the $$$ when the birthday rolls around. I can’t believe how time is flying because I remember when he was just 1 lol. Where did you get FP freebies? We don’t have time to follow the coupon sites any more so we miss everything. Keep up the great work…. you used plenty of coupons this week which was impressive. What do you reckon you will do for your grocery budget next year? When does the meat order end? Keep up the great work. You get ballot 5. Our weekly budget is $100 making this month $400. Spent a little extra this week but worth it considering what we got. The cottonelle coupons were from targets flyer, I’m sure you can print it off their website, for $2 and the $1 coupon was from an insert that expired on the 9th, because you can stack a target and manufacture coupon at target you can save a lot if it matches up with a sale like this did 🙂 If you are using more than two coupons in a transaction it is probably best to go to customer service otherwise the cashier supervisor has to come and approve every coupon. Making homemade perogies is great but only if you have the time. I forgot to redeem the checkout 51 for the perogies I bought and missed out on $1, oh well. We planned to shop in the US this long weekend but I decided to push my shop back until November 21st … so I only have some “too good to miss” Canadian grocery items to report this week. Not only did I get in on the sale but we also picked up a rain check for another 3 dozen eggs @ $3.99! Yippee!!! I don’t actually cook with the limes and lemons usually Mr CBB… I eat them as a fruit. One of my medications reacts with grafefruit, pomello, tangerines etc so I eat lemons and limes that don’t diminish the effectiveness. The Thrifty points are good for cash redemption at the register…$5 here, $5 there… it all helps. I have saved my points so far for the day when we don’t have enough cash to cover the bill and need to redeem some points. 🙂 I was actually impressed with the 2 Cauliflowers for $5 – I see a soup in our near future! We have oodles of Cowboy Bacon Beans left from last night’s supper but no soup in the fridge! Yikes! Can’t have that!!! Can I??? LOL I think I’ll make a nice Chicken-Potato-Vegetable rustic pot of soup tomorrow. It’ll be chock-a-block full of vegetables…celery, carrots, onion, tomatoes, potatoes, cauliflower, turnip, parsnips, rhutabaga, green beans, lima beans, corn niblets and peas!!! Really it’s more like a chicken stew…maybe I should make that instead. I haven’t had a nice creamy chicken stew in a long time! OMG it’s going to be delish! we are no holiday baker here. husband doesn’t like sweets, so i am the only one. with the cookies and cakes i bake for myself it is good enough lol so no extra cost there. ~phew good thing hehe. Time to post my shops for the week. Both shops are at Foodland. Well that is a decent start to November, over slightly but not by much. I have three weeks now to work on coming in under budget and maybe get some baking supplies for the Christmas baking. My challenge for this month for sure…. The cider mix is no longer on sale but I managed to get 8 boxes so that should keep us going for a while. The older boy is happy about it. I bought one case of store brand ginger ale and that worked out OK. It went over well enough. I do have to watch the brand there as there is one brand nobody likes, one the younger boy can’t drink as it bothers his tummy and the one I normally buy. They were out of the one I buy so I tried the store brand. It’s on sale this week and they got the right brand for us in so that will show next week. I buy the broth in the Tetra packs already made. I find the cubes just seem to be salter tasting than the broth, could be just me but that’s the opinion. I have the rest of the chicken broth I made yesterday in the freezer now too plus the turkey broth from Thanksgiving. I do like the broth I make from cooked bones and such leftovers…it just seems to have a little more flavour and it’s darker, not as watery looking…. Mrs Scrooge here… no Christmas baking at our house! Neither one of us are big on holiday treats but we do look forward to the President’s Choice Candy Cane ice cream as a treat. We usually pick up a couple of cartons thru the holiday season. I make lots of quick breads throughout the year though, so I do keep my eyes peeled for good sales on nuts and chocolate. The pantry is bursting at the seems with goodies though so I expect we can pass on the high ticket items now until 2014. I am watching for Hershey’s chocolate chips for my sweetie’s homemade muffins. I usually get 1 bag at Costco in the US and it lasts us for a year. Weekly Overview: I remained cool this week because, clearly, I didn’t have to do much shopping. I must’ve been stocked up from October’s shops. With only 9 weeks left, it seems I’m on track with this grocery thing. Next week may be a little heavy since I am trying to shop for 2 weeks worth of food at a time. Bulk Barn has their $3.00 off coupons right now. You can get them on-line at Bulk Barn sight as well. $3.00 of a $10.00 purchase. Brown sugar is on sale there as is chocolate chips right now. Thanks I’m going to go print one now! I always start out with the holiday baking with the best intentions, and end up throwing in the towel and buying the treats. I lack commitment, and I’m always incredulous as to how expensive holiday baking can be. It really ends up costing an arm and a leg. I am always shocked as to how expensive baking is. Flour is cheap, and so is sugar, but anything to make the baking actually tasty is so costly! Not that I need any more baked goods in my diet, anyway. But during the holidays, we always find ourselves baking something. This year I’m planning to make chocolate covered pretzels and possibly peanut butter kiss cookies. I’m hoping I can convince to do a cookie swap with a few of my friends. We’ll see if I can get them on board. I do a fair bit of baking for Christmas but not cookies so much. I make a dark fruitcake and a lighter cherry almond cake plus I make a lot of squares. I make cranberry squares, buttertart, pineapple and three kinds of nanimo squares(regular, cherry and mint)… I might make an Irish Cream nanimo square this year, not sure yet.. I also make a cranberry coffee cake and bark, with white, milk, or dark chocolate wafers and with crushed mint candies or with dried cranberries and almonds. We’re not that big on walnuts here, we use almonds more.Hubby complains about the cost every year…..usually while he is scarfing down the latest treat…. 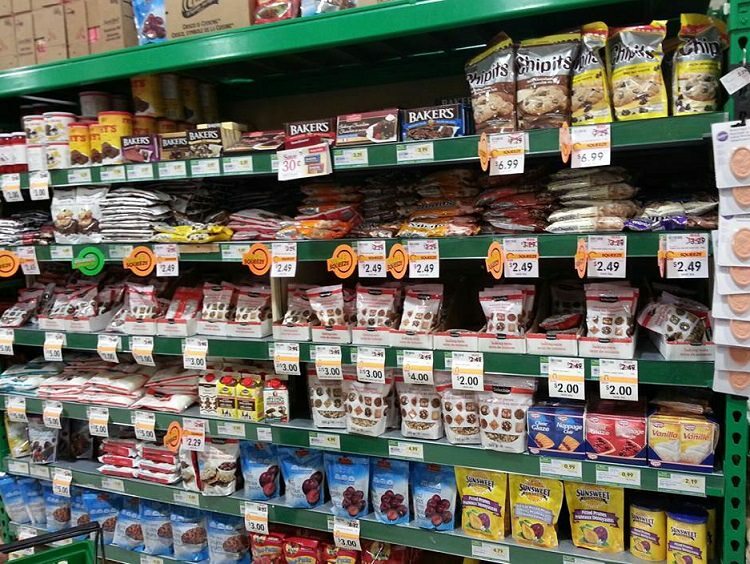 I’ll hit the bulk store for the good quality candied fruit for my fruit cakes… and some spices like cinnamon. I’m hoping for a good sale very shortly on flour, that nice big cheap bag I got a little while ago at NF is over half gone!!! I have butter in the freezer as well. My sugar supply is in good shape now. I buy a few bags every time I find it on sale. When the kids were in school I sent trays of goodies to the teachers and the bus driver as a Christmas gift. Took some into the staff room the last day of school before the break too, it was very much appreciated!!! I also take a fruitcake and a few goodies to my daughter’s former boss every year as a gift, it makes him so happy!!!!! I stash the baking in metal cookie tins in the freezer for safe keeping!!!! Lol!! I find the bulk store has the best quality product for my baking and I try to spread out the cost as much as I can, not always successfully. There are some things that are classed as basics here I get there, cinnamon, chocolate chips, sliced almonds, Thompson raisins are all things I don’t want to run out of any time of the year! 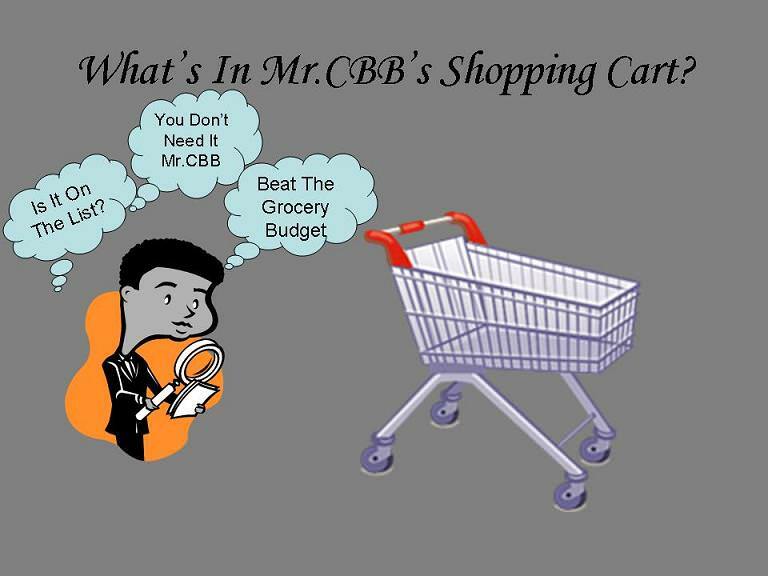 Mr CBB… did you pay $41.88 for avocados? How many did that give you?? Or is that suppose to be 4 x $1.88?